Hiya folks, long time no see! 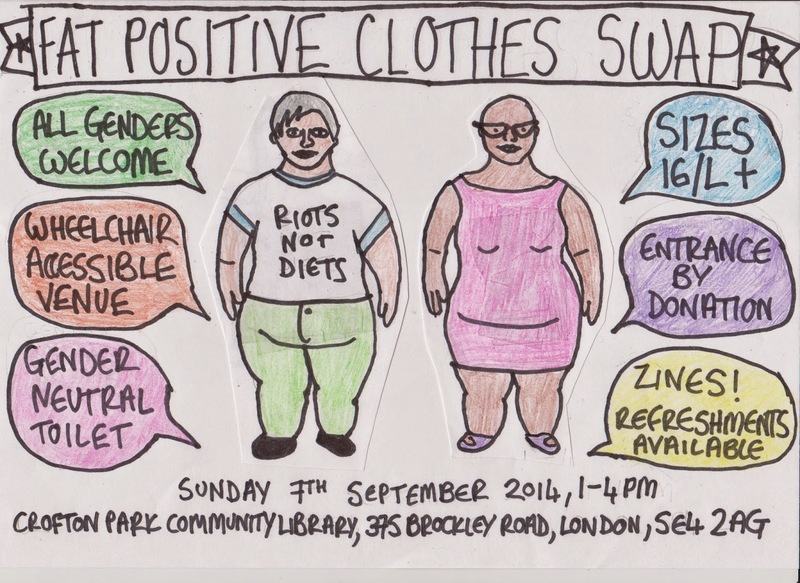 Just a quick post to let you know that I'm going to be hosting a fat positive clothes swap on 7th September in London. There'll be clothes and zines and cake and lots of opportunities to meet other rad fat people. The one in February was fantastic so would love to see more of my readers at this one. RSVP via facebook here and you can make donations in advance here (if you can do this, please do as we're paying to hire a venue this time!). If you have any questions feel free to get in touch. I'd love to know more about how it works. I'm wanting to host one in my town, but I'm unsure of the logistics. How do you keep people from taking everything? Do you charge an admission? Sounds lovely. Wish something like this was happening where I live. This is really such a positive event that everyone should know of. You are an inspiration! We at Rosser would like to spread such good news. Our SEO company can help you take it to the next level and gather more people. Nice review. Very helpful and informative.